Do you have a vehicle that is basically collecting dust, you no longer want, thinking about trading in or can afford to donate? You can support KTSU by donating your used car, motorcycle, RV, or boat. Just call toll free 1-855-909 KTSU (1-855-909-5878) for information and to schedule a pickup that’s convenient for you – or fill out our quick donation form! All you need is a clear title, and we’ll take care of the rest—including convenient pickup and a receipt—at no cost to you. We will mail you a confirmation when your vehicle has been sold. 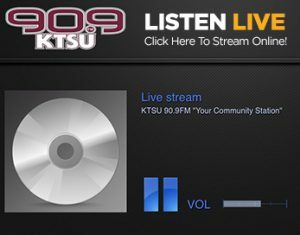 What are the benefits of donating my car to KTSU? KTSU benefits by receiving a cash donation to fund its one-of-a-kind programming. You benefit by being able to reduce your taxable income when taxes are itemized. Plus you avoid the costs associated with hauling it off or selling it. Plus you can avoid the possibility of essentially giving away your car in a meaningless trade. There is no need to pay for vehicle registration, insurance, and repairs to keep your car in running condition while you wait for a buyer or decide what to do with it. In most cases it does not but we can quickly determine that when you call and tell us about your car, truck, RV or motorcycle. Contact a representative at 1-855-909-KTSU (855-909-5878) to find out if your vehicle qualifies for pick-up. We make donating your car as simple and convenient as possible. A tow company will contact you within two to three business days and arrangements can be made to pick it up.